I got lost again today, in more ways than one. Throughout the day I lost the trail a few times, once by a surprisingly wide margin. 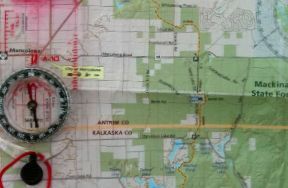 After blundering awhile with my compass and map, I found myself on a long paved road. I snuck a look in someone’s mailbox and to check the address on their mail and figure out what street I was on. Clever trick right? Yes, but the road on the envelop wasn’t labeled on the map so it didn’t do me any good. I’m lucky that my route was leading me to an actual town. I was able to follow the increasingly dense buildings, pavement and cars, which eventually funneled me into the tiny village of Kalkaska. By the time I got there, my shoulders were on fire. I still had a few more miles to get to my campsite and I couldn’t pass up the temptation to sit and eat a real meal. I went to a crappy restaurant, ordered from the bar, ate a lot of bad-tasting fried food, went to the bathroom, and threw up. Just like that. I’m so disappointed in myself. Hiking from that restaurant past strip-malls to the glorified trailer park where I’m staying tonight was like walking a gauntlet of self-reproach. All the things I was mad at myself for yesterday are nothing compared to this. I failed myself today. Before this, I honestly believed that throwing up on this trip would be impossible. I thought that all this time to be with myself and stay focused would automatically keep me on track. I thought it would be impossible to be anything other than perpetually completely mindful. How am I still so naïve? I know, or at least I should know, how fabulously good I am at turning off my brain and distracting myself. It’s far harder to be mindful than to lose my mind, otherwise I wouldn’t have had to quit my entire life to address this problem. Today, as yesterday, I hope I can learn from my mistakes. I‘m trying to retrace the steps and decisions that got me to that point so I can avoid them next time. I know I can get better at getting better, I believe it, but right now all I can do is mourn. This post is so raw and really hits home with me. I sit here crying as I read your words. Thank you for being so brave to document your journey. Thank you for feeling that. It means a great deal.